I’ve been busy getting all the details figured out for the “Message in a Bottle: Ocean to Ojai” writing workshops that I’m doing with Danika Dinsmore as part of Ojai’s WordFest March 19-27, 2011. 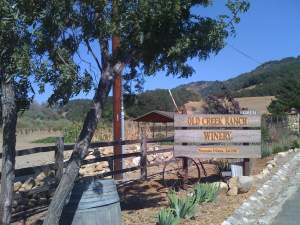 A week or so ago I checked out venues for the winemaker dinner and open mic for Thurs March 24 and stopped by Old Creek Ranch Winery to talk with owner John Whitman and winemaker Michael Meagher. We also enjoyed some tasting: the petit sirah from the barrel is out of this world delicious! And while I can’t make any promises, it’s looking likely that the cherry trees will be blooming at Old Creek Ranch Winery! Here are all the fabulous details–menus and wines to come soon! Sounds like the makings for a great workshop.